A beautiful yarn producing fantastic results. Light but warm, it lends itself to all types of garments. Durable and hard wearing but soft to the touch and smart in appearance. 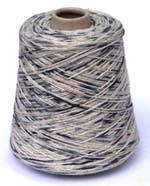 This yarn can be used single or double for machine or hand knitting. It is also suitable wound treble for chunky machines or hand knitting. Average requirement for a jumper or cardigan using the yarn double (2 ends wound together): 300 to 400 grams. Being a natural fine quality fibre it can be knitted on a loose tension as successfully as on tight tension with stunning results depending on the type of texture desired. Machine Knitting: Tension 2 to Tension 10. Hand Knitting: Needle size 2 mm to 5 mm. There are at present no patterns available for this yarn, however some ROMA or FINE CASHMERE patterns can easily be adapted to this yarn. on 400 gram cones at £56.00 each. Design 63 is ideally suited for this yarn. The pattern is available for machine and hand knitting. A soft natural fibre blend of Wool and Silk. 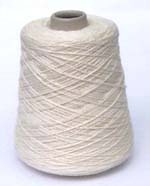 Due to the yarn's supple characteristics the Nm Count of 3/9.000 (somewhere around what is generally known as a 'fine double knit') still allows it to be knitted on a standard gauge machine on every other needle as well as on a chunky machine and is well suited for hand knitting. 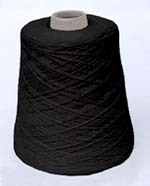 A 400 to 450 gram cone will knit a jumper or cardigan. Approximately Tension 10 on a standard gauge machine working on every alternate needle; Needle size 5 to 5.5 mm for hand knitting.